^ http://gwydir.demon.co.uk/jo/maps/uktowns.htm "They were the administrative centre for local government, the market town, and the largest town in the county. However, local government has been reorganised more than once, and today the county towns are not necessarily the adminstrative (sic) centre of the county"
^ https://play.google.com/store/books/details?id=sbcuAAAAIAAJ&rdid=book-sbcuAAAAIAAJ&rdot=1A Collection of Statutes Connected with the General Administration of the Law: Arranged According to the Order of Subjects, with Notes, Volume 8 page 344 "The Names of Towns limited for the safe Custody of Weights and Measures according to the King's Standard for the Shires following, as particularly appeareth ... Surr. 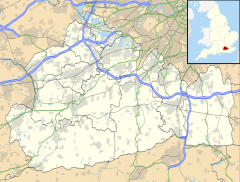 The Town of Guilford"
This page was last edited on 15 April 2019, at 15:51 (UTC).